During the research done by the Greyton Heritage Museum on Greyton and surrounds, some incredible information has been found, the information gathered has only proven that substantial more time and energy needs to be spent on further research. As part of this ongoing research, contact has been made with previous residents of the village and families of original inhabitants of the area, the objective is to piece together as much of the information so that a proper history of our valley can be collated. In a bid to get the information into the public domain, The Ward 2 Forum in conjunction with the Greyton Heritage Museum will publish all information through the website and the social media platforms. It is envisaged that a manuscript will eventually be produced for the print media and eventual final publication. 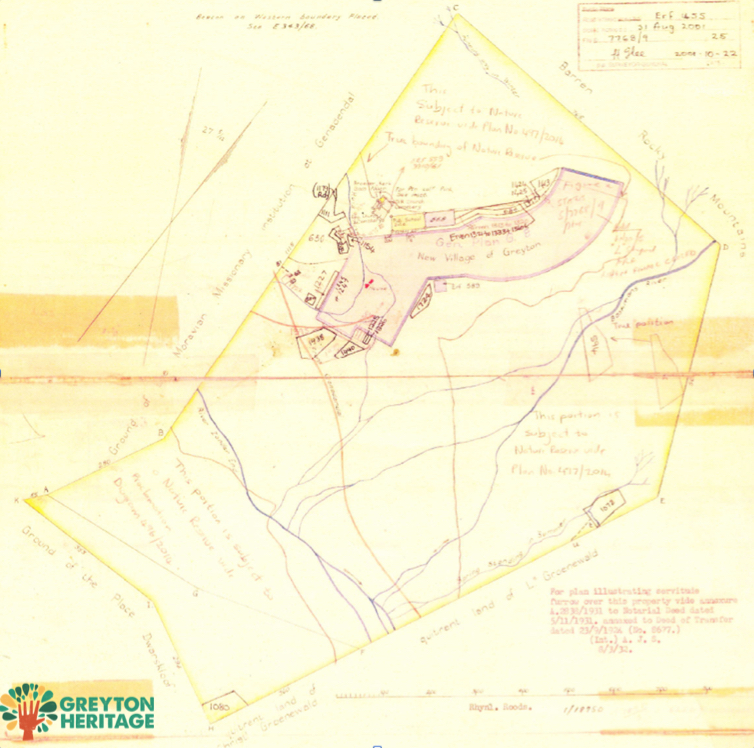 The map hereto attached was produced in 1839 and has been amended from time to time as development on the Weltevreden Estate (now known as Erf 595) took place. Interesting to note the river names then, and the route of the Genadendal – Riviersonderend road (now R 406). Below are some extracts of the original 1854 “Conditions of Sale” document that was made available to us by Keith Radmore (great grandson of Herbert Vigne). Extracts from Conditions of Sale of Erven in the projected Village of “GREYTON”, situate on the Estate WELTEVREDEN, in the Division of Caledon, held on the 27th, and 28th days of November 1854. To the said extent of Morgen as hereinbefore mentioned, so set apart to form and constitute the said Village, the Seller attaches and cedes, as Town Common, the remainder of land of his Estate Bosjesmanskloof, which Estate is in whole extent 1,866½ Morgen, or 3,733 Acres, as will be seen by the original Diagram thereof, dated the 5th day of February 1839, which shall remain for ever inalienably appropriated as such Town Common exclusively …….